AICDs are enabling production engineers to manage reservoir uncertainty along the well with better flow assurance and greater oil recovery says Tendeka’s Ismarullizam Mohd Ismail. The continuing progression in the development of technology in the oil and gas industry is enabling engineers to reach increasingly more challenging thin oil rim hydrocarbon reserves, which may have once been considered inaccessible. Operations at depth or in ultra deep environments have become relatively standard practice, while advancements in drilling technology over the last few decades have led horizontal and multi lateral wells to become more common. These wells generate significantly greater reservoir contact in comparison to vertical wells. As a result, these wells can produce more oil and gas with a lower draw down pressure along the wellbore. While long horizontal wells can increase the productivity and recovery of oil by increasing reservoir contact, uneven production due to reservoir heterogeneity, varying permeability, saturation or frictional pressure losses along the length of the horizontal bore can lead to early water or gas breakthrough in parts of the wellbore. This may negatively impact oil flow from the rest of the well. Water influx can cause a reduction in the capillary pressure between sand grains and can result in an increase in sand control issues for the operator. Inflow control devices (ICDs), which restrict flow by creating additional pressure drop, have been used for several years to mitigate such problems. However, they are passive in nature and, once installed, cannot be adjusted. In the event of water or gas breaks through in one part of an oil well, the disadvantages of the passive ICD becomes clear, as the oil production is overwhelmed by the production of the unwanted fluid. A relatively recent technological breakthrough in this area has been the development of autonomous inflow control devices (AICDs). These are self-regulating flow control devices that have the ability to change the amount of flow restriction based on the properties of the fluid flowing through them. 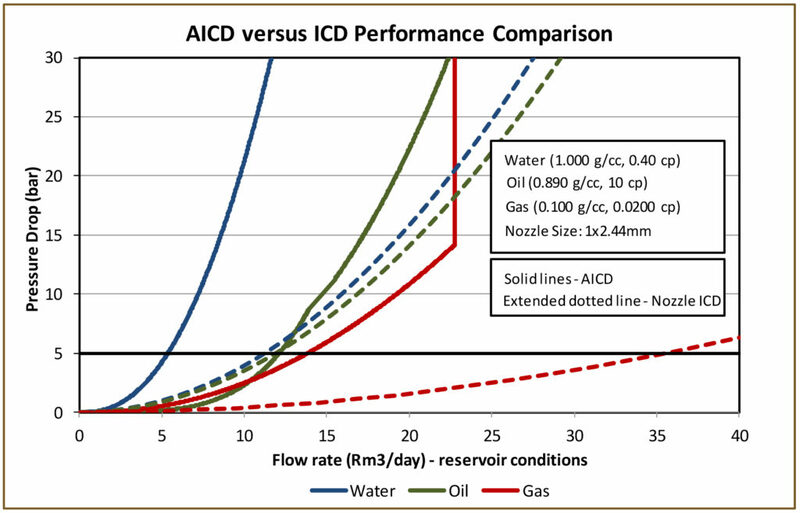 Unlike passive ICDs which produces greater flow restriction for fluids with higher viscosity, the AICD can restrict water and gas more readily than oil. This ability allows for more even oil flow from all segments of the wellbore and prevents the excessive production of unwanted fluids from segments that have experienced breakthrough of water or gas. Ultimately, this capability results in greater oil recovery with a lower water cut and lower gas oil ratio. In the current business environment of low oil price, technologies and processes which can maximise production and increase recovery become even more critical to enhancing value. 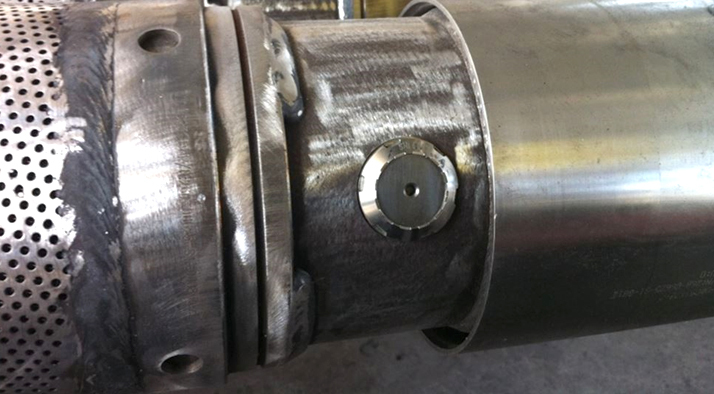 Once a well has been drilled and the quality of the reservoir evaluated, the optimum completion solution for maintaining regular and uniform flow must be designed. Traditionally this was achieved using selective, zonal perforation of the production liner, and remedially using plugs to block off sections of the well where water or gas ingressed. Unfortunately, this method of flow control is uneconomic in thin oil rim, despite the range of solutions available today. Since the early 1990s, with the introduction of horizontal wells, ICDs became recognised as a solution for the management of effective flow distribution aimed at preventing premature breakthrough of unwanted fluids. They have been deployed successfully at locations throughout the world. However, the lack of flexibility afforded by ICDs led to the evolution of the AICD, transforming once passive technology into a fully autonomous device. AICDs are able to constantly adapt to changing parameters along the entire length of the production interval and allow for greater control of reservoir production. One type of AICD, an award-winning levitating disc-based valve from Tendeka, has been deployed successfully in more than 75 wells globally with more than 15,000 valves in light and heavy oil reservoirs to overcome water or gas breakthrough and ensure uniform production. The valve, which operates through adapting to changes in fluid viscosity, preferentially restricts the flow of low viscosity unwanted water and gas whilst promoting the production of oil from the entire length of the well. The greater restriction of low viscosity fluid is created by the movement of the disk to create a smaller flow area through the AICD and hence, a greater flow restriction. The Tendeka autonomous ICD controls both gas and water while its design also permits washdown and spotting of breaker fluids during deployment of the lower completion. The Tendeka AICD, is configurable for a range of production conditions, and can be incorporated easily into a screen joint without base pipe inner diameter protrusion. An example of where Tendeka’s AICDs have been successfully deployed is on the Troll field, offshore Norway. The AICD is incorporated with premium screen to provide sand control and inflow control for a thin layer oil rim of between 11 to 26 meters. In the early years, passive ICDs were employed in the field, however once gas breakthrough occurred the high mobility of the gas rapidly dominated the flow in the well. A 20% increase in cumulative oil production of was recorded in the AICD completion trial well within the first 18 months of production in comparison to a passive ICD equivalent. AICDS are enabling production engineers to manage reservoir uncertainty along the well with better flow assurance and greater oil recovery. The ability to restrict low viscosity unwanted water and gas results in lower water cut and reduced gas oil ratio. The Troll example is just one of several where AICDs are proving better gas control and operators switch from ICDs to AICDs. 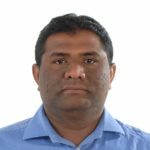 Isma Mohd Ismail is product line manager for sand control/inflow control for Tendeka based in Aberdeen, UK. He is responsible for sand control and inflow control product development, material selection and subsurface modelling. He holds a PhD and MSc in Mechanical Engineering from University of Leeds, specialising in Oilfield Sand Erosion and Corrosion.